The field is officially set for the 2017 U Sports men’s basketball Final 8 tournament, taking place from March 9-12 at the Scotiabank Centre in downtown Halifax. The host, Dalhousie Tigers, and cross-town rival, the Saint Mary’s Huskies will both be in action, starting Thursday night. Saint Mary’s takes the court at 6 p.m. against the No. 1 seeded Ryerson Rams, who won the Ontario University Athletics conference. Whereas, the Tigers are in action at 8 p.m. against the No. 4 seeded Alberta Golden Bears, who won the Canada West conference. With both Halifax teams participating, The Signal decided to break down a few key players. The Tigers, winners of the Atlantic University Sport (AUS) conference for a third straight season, are led by guard Ritchie Kanza Mata and forward Kashrell Lawrence — both of whom are in their fifth and final year of eligibility. Fourth-year forward Sven Stammberger is also a key member of the squad. Kanza Mata, a two-time recipient of the AUS defensive player of the year award as well as a two-time AUS first team all-star, anchors the Tigers on both ends of the court. He led the squad in steals per game this season, with 2.4, and broke the AUS career assists record with 605 assists. The previous record of 535 was set in 1995. Lawrence, a 2016-17 AUS first-team all star, is a fierce two-way player for Dalhousie and led the team with 6.8 rebounds per game this season. He’s also a force when playing offense. He lead the team in free throw attempts, with an average of 4.4-6.6 per game and was also first in points per game, with 15.2. Stammberger was Dalhousie’s best shooter from the perimeter this year. He shot 40.2 per cent from three-point range and averaged 14.3 points per game, which ranked second on the team. 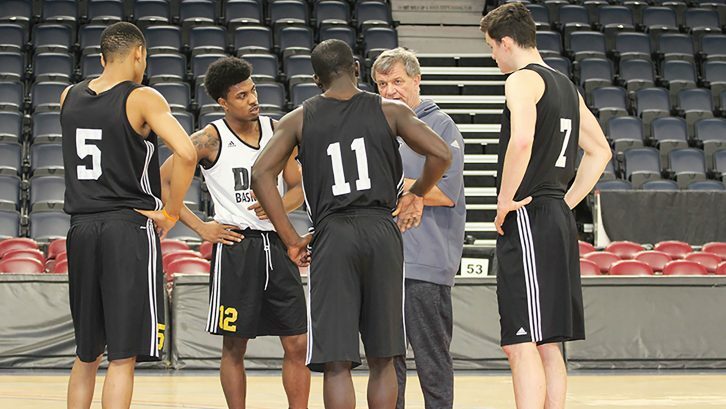 Dalhousie head coach Rick Plato believes his team is up to the task against any opponent. A trio of experienced guards anchor the AUS runner-up Huskies, in fifth years Marquis Clayton and Brian Rouse, and fourth-year Theon Reefer. Clayton is the team’s best scorer, averaging 19 points per game, along with a 40.7 shooting percentage from three-point range. He also dished out 3.9 assists per game. Rouse and Reefer are both long, athletic players who are dangerous on both ends of the court. Rouse contributed 15.5 points per game and was 12th in the nation with 38 steals. Reefer added 17.5 points per game and had 6.8 rebounds per game. Huskies head coach Jonah Taussig acknowledged the abilities of his squad, but also noted the skill level of the Ryerson team. “I have the utmost respect for (Ryerson head coach) Roy (Rana) and his program,” Taussig said at the news conference. “You don’t get the number one seed without being just a terrific team.